To avoid the necessity for drydocking when an examination of stern bearings amid tailshaft is needed, split stern bearings were developed. A suitable outboard sealing arrangement and design, permits the two halves of the bearing to be drawn into the ship, exposing the shaft and the white metal bearing. In the Glacier-Herbert system (Figure 8.16) the two completely symmetrical bearing halves are flanged along the horizontal centre line and held together by bolts. The after end of the bearing carries a spherical support ring to which is bolted the outboard seal housing. A series of axial bolts, fitted with Belleville washer packs to ensure virtually constant loading of these bolts and those securing the spherical seating ring, hold the diaphragm firmly in position. This arrangement permits sloped alignment of the bearing to give full support to the drooping tailshaft. are used to hold the bearing positively in its final position. The arrangement is such that it allows for the differential expansion of the bearing and its housing without detracting from the rigidity of support at the forward end of the bearing. 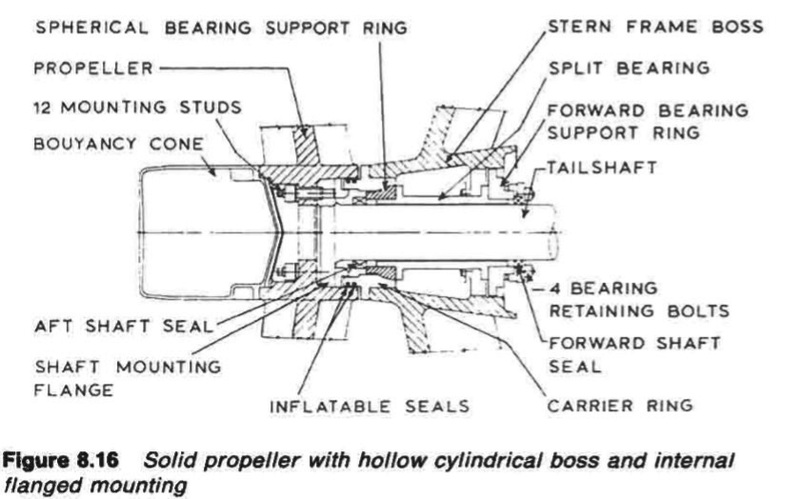 The propeller shaft is flanged at the after end and the hub of the propeller is bolted to the flange. On the inboard side there is a shroud around the spigot projecting aft from the carrier ring. Two inflatable seals with individual air supplies are fitted in the periphery of the spigot. These can be inflated to provide a seal against inflow of water. Sealing the stern bearing space permits work to be carried out on the stern bearing and seals, without the necessity of drydocking. An alternative to using the inflatable seals, is to apply a sealing bandage around the small gap at the carrier ring flange. The propeller shaft has two short rotating liners of chrome steel. The liner at the after end is bolted to the propeller shaft flange. The inboard liner is fixed by a clamping ring. These liners act as rubbing surfaces for the rubber lip seals. The coupling at the forward end of the tailshaft may be of the SKF oil injection type (i.e. muff coupling) described previously. 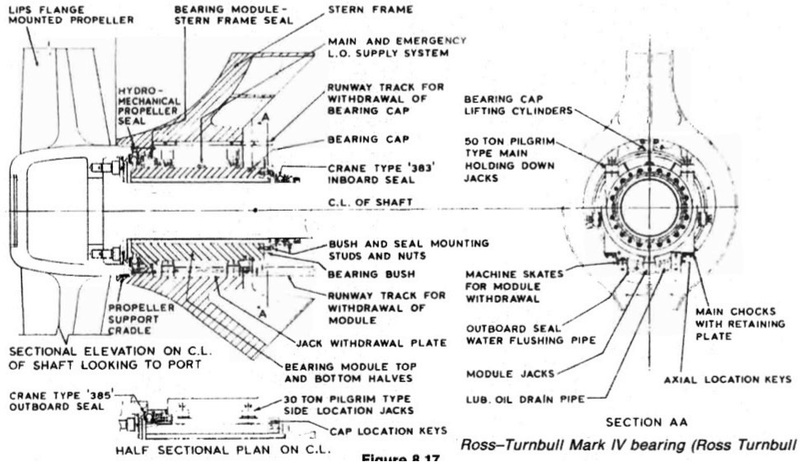 The Ross-Turnbull split stern bearing (Figure 8.17) has a bottom half bearing which is chocked on to two horizontal fore and aft machined surfaces within the stem frame boss. The whole bearing is held in position vertically by two 50 tonne Pilgrim type jacks, the chock thickness determining the bearing height. These jacks also hold the top half of the bearing in place. Lateral positioning of the bearing is by 30 tonne Pilgrim type jacks arranged on each side of the bearing. A running track is arranged above the bearing to allow easy transport of the top half. Skids are provided below the bearing to provide easy transport of the bottom half. When removing the bearing bottom half, a jack is first placed underneath it to lift it free of its chocks. The chocks are removed and skates are placed under the bottom half bearing. With the chocks out, the assembly is lowered until the propeller rests on the shroud or support cradle, which is part of the stern frame boss. Further lowering of the jacks, brings the bottom half away from the tailshaft until its weight is taken by the skates resting on the skids. The jacks are removed and the bottom half bearing is brought forward on the skates together with the seal face and the bellows section of the outboard seal.